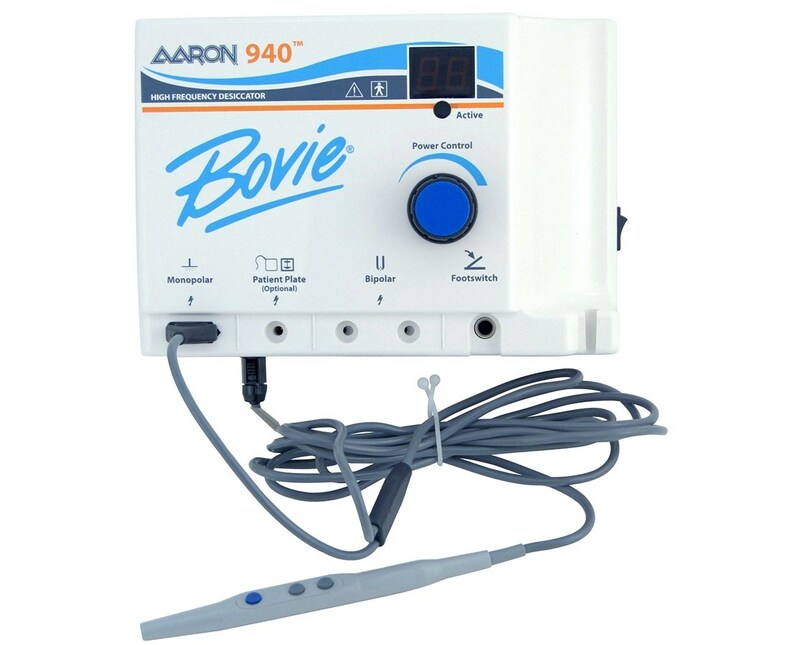 The Aaron 940 High Frequency Desiccator from Bovie is an electrosurgical device with higher power than the Aaron 900 but no cutting power, useful for dermatological procedures. This device is top of the line in terms of safety, convenience and economy. The Digital Error Detection constantly monitors output and automatically shuts down at any sign of a problem. 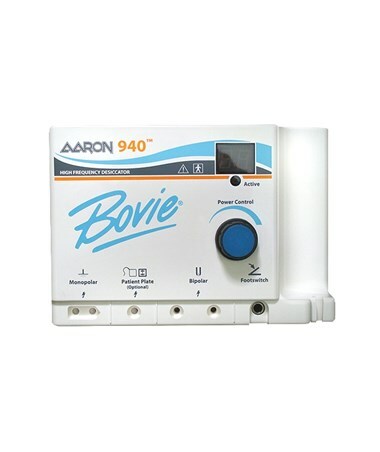 The power on your Aaron 940 can be easily changed in 1/10th watt increments by just turning a knob on the desiccator or using the included handpiece with up and down buttons. 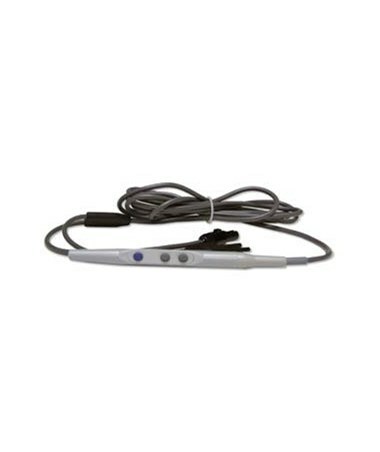 There is also an option to purchase a foot controller to use alongside the handpiece. 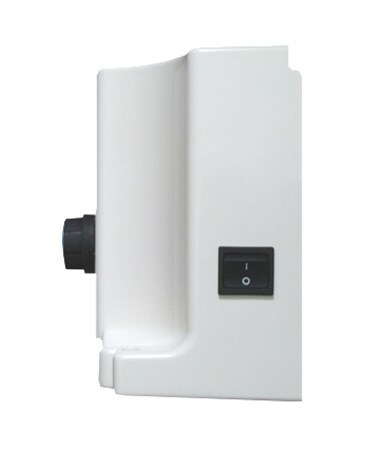 Because this High Frequency Desiccator was built economically, you will find that all accessories needed for this device can be bought at a great price. 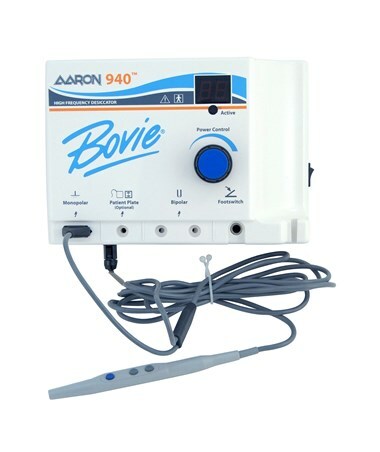 The Bovie 3 button handpiece allows the user to activate the Aaron 940 and put the power up and down very easily. The buttons are designed for the ultimate in ease of use and comfort. The handpiece is extremely well designed, including a collet to hold the electrode exactly where you want it as well as it being gold plated for superior conductivity. This handpiece is also autoclavable, making it much easier to clean and available for use whenever you want it. The Aaron 940 High Frequency Desiccator can be used universally with 100-240 VAC and has a 2 year warranty.